Build a Culture of Productivity™ with PlanPlus Online. 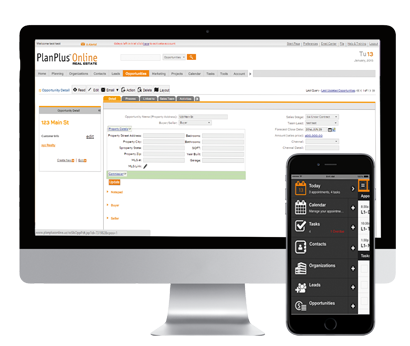 PlanPlus Business Edition is the only software product that combines a proven productivity engine used by over 15 million people with powerful Customer Relationship Management tools. With collaboration, sales, marketing, and project management features, PlanPlus Online’s Business CRM solution enables productivity and ensures accountability within your company. Track Contact or Companies as primary records and manage relationship history and link activities for. Sales opportunities, pipeline forecasts, quotes/proposals, products, sales credit, team member, reports and dashboards. Complete lead workflow from custom lead web form builder through conversion. Send blast campaigns or integrate drip campaigns into your sales process. Includes hundreds of email templates to choose from or add your own. Calendaring is a critical component of any planning system. This calendar allows you to drag-and-drop tasks to create appointments, color code appointments, create recurring appointments, set appointment alerts and reminders, link notes to appointments and invite external contacts to appointments via email. You can also integrate calendars from other calendaring programs into your PlanPlus Online calendar. Start your week by reviewing your Mission Statement and Values. Next, review your Roles and identify the most important activity to keep your life balanced and your saw sharpened. Then move on to review your Goals and add any related Goal Intermediate Steps to your weekly Calendar or Task List. To achieve success personally or professionally, you must have Goals. PlanPlus Online allows you to track your Goals and their Intermediate Steps progress. Keeping your eyes on your Goals will create the energy, focus, and determination required to achieve them. Calendar sharing is an essential element for productivity in a group, team, or entire company. Improve your collaboration efforts and scheduling capacity by understanding who is available, when resources are available, and when external contacts need to be invited to appointments. PlanPlus Online includes an integrated Email Center that can accommodate multiple POP or IMAP accounts. Each account can be kept separate for keeping your personal email apart from your business emails. For outgoing messages, you can choose which email address to show as the sender. PlanPlus allows you to track separately the contacts that you work with as well as the organizations they belong to. Organize all of the important details such as Organization or Contact information and link notes, calls, tasks, appointments, and emails to each Contact or Organization’s history. Keep track of your sales pipeline by Sales Stage, Forecast Status, Win Probability, Close Date, Sales Rep, Channel Source and many more options. Customizable, Real-Time Dashboards provide instant access to real-time analysis that is needed to make the best decisions. Dashboards provide critical metrics with animated Flash Charts to identify trends and act immediately on them. Pre-configured, one-click — Customized Dashboards provide decision-making information to each sales role, from sales representatives to executives. The real-time dashboard is an executive’s or manager’s “Main Page” to display critical metrics the instant they log-in. Sales representatives utilize the sales opportunity chart to identify their most valuable opportunities. Sales managers utilize the pipeline chart to identify clogs and increase pipeline velocity. Executives utilize the sales status and stages to predict future revenue. PlanPlus Online Dashboards provide real-time analysis of your business. These reports will give you the competitive edge in today’s fast-paced business world. Most reports enable drill-downs into the actual data to see each sales opportunity or details presented from the graph or chart. PlanPlus Online Dashboard charts and reports are available for export in PDF, HTML and CSV data formats. Sales managers now have the ability to instantly publish their reports to executives and sales team members. Sales forecast win probabilities can be manually set by the sales reps or they can be driven by rules associated with the sales stage. Additionally, a manager can set up a quota for each sales rep and compare performance versus quotas. PlanPlus Online’s Sales Force Automation (SFA) module enables sales managers to achieve the maximum potential from each sales associate. Customizable to their company’s products, services, sales channels and competitive position, they can design and implement their sales workflow or methodologies. PlanPlus Online combines your “Best Practices” and workflow methodologies to increase sales. It enables sales managers to apply “what their best sales performers know” and to guide others to become top performers. Workflows enable managers to quickly identify and react to changes in their sales pipeline performance. Design each workflow with automatic triggers to update field values, send email, create appointments and tasks. As internal processes evolve, you can quickly branch to the appropriate workflow and maintain complete sales history activity. Institute your best practices to coach each sales representative to be a top performer. Then adjust and optimize the sales workflow to maximize your ROI. Ensure easy and prompt follow-through or escalate sales opportunities to a more experienced sales representative. Stay in contact with your prospects and deliver a series of messages with automatic pre-defined templates for emails, appointments and tasks. Automate sales interaction scripts, rules, etc. Webforms are forms that can capture information from your website and send the information directly to your PlanPlus Online account in the form of a Contact, Opportunity, Lead, Case and more (varies by edition). Design your own forms using Custom Fields. PlanPlus Online webforms can be configured to automatically send an automatic reply and a series of sequential emails to the website visitor. As the site owner, you or your sales team can also recieve an email each time the form is filled out. Creating Custom Page Layouts is the simpest way to make your PlanPlus Online account feel like a custom-designed web application. Do you have forms or paperwork that you would like to get rid of? Automate your data-capture and sorting capabilities by creating Custom Fields and Drop-Down menus. If your business involves prospecting from Lead lists, the Leads Module is what you need. Track Leads by source, report on calls to Leads, track Leads converted to Opportunites or Customers. Blast Campaigns are excellent for monthly newsletters, special offers or just sending a quick message to a large number of records. Each email is delivered with a single user and email address in the “To” line. This keeps you from sharing your entire email lists every time you do a mailing. Each email campaign is tracked using a special tracking code that allows you to pinpoint who opened your emails and what links they clicked on. Drip Campaigns are excellent for a creating a series of emails that follow a specified order. If you are welcoming new customers to your product or new members to your organization, you might create a “Welcome to our Service” Drip Campaign. These Drip Campaigns can be manually attached to a single record, attached to a group of records, or can be attached daily based on a query routine that searches for records meeting a certain profile and starts them on the campaign. PlanPlus Online can be your central repository for important documents. Documents can be stored based on a folder structure that you define. Control access privileges to sensitive documents. PlanPlus Online makes it easy to store new hire paperwork, marketing literature, company forms, customer documents, project documents, personal documents and more. All of the documents can be easily included in emails or email templates for users with access to the documents. All customer communication is stored in their contact notes history log. Since PlanPlus Online is an on-demand, Web-based application, documents are available anytime and anywhere. Sales quotes are never lost since they are generated and stored in each sales opportunity. Then automatically update, clone or convert each quote to an invoice. It’s in one complete system so documents are never lost.